While much of Washington was spending this past summer loudly conspiring to lower the country’s credit rating, one American official, in a far-off city, was offering a profoundly contrasting example of quiet professionalism. 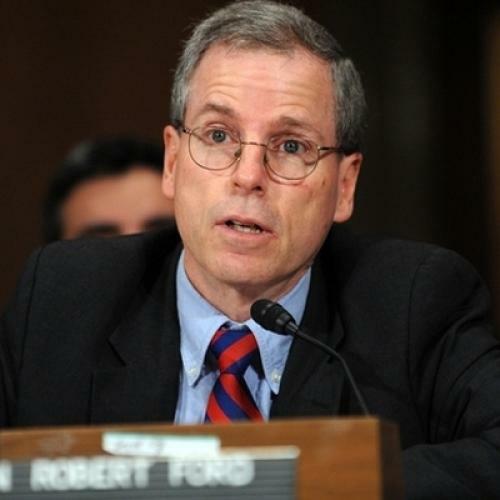 Robert Ford, America’s ambassador to Syria, has shown bravery, tact, and creativity in finding ways to bear witness to the protests and massacres occurring in that country over the course of this year. Unsurprisingly, his efforts have not endeared him to the Syrian government: Ford has been assaulted multiple times by pro-regime thugs—this past week offered only the latest instance. Equally scandalous, however, is the fact that Ford’s reception in Washington has not been appreciably better. With the Senate having given little indication that the ambassador’s appointment will be renewed, he may be forced to leave Damascus at the end of the year—not because of the machinations of the Syrian government, but of our own. If he is forced Ford to leave Damascus at such a crucial time, Congress would be administering a massive self-inflicted wound to U.S. foreign policy. But that would be nothing new: The American people have long received outstanding service from their diplomats, but that service rarely receives the appreciation of the better-known cadre of government employees in Congress. The approximately 11,000 members of the American Foreign Service work with little publicity or reward, staffing over 250 overseas embassies, consulates, and missions, from Mexican border posts, to Peshawar at the foot of the Khyber Pass. Congress likes to opine on Iraq and Afghanistan, but Foreign Service workers are among the government employees who are actually defending American interests there. They often live and work in the midst of war, civil strife, and terrorism: The imagined routine of cocktails and civilized discourse that is thought to typify the work of a diplomat could hardly be further from the truth for many of them. Like their military colleagues stationed around the world, they have sworn to defend the United States Constitution and maintain the values of “duty, honor, and country.” The dozens of names inscribed on the American Foreign Service Association’s memorial wall of honor testifies to the harsh realities of their lives. It is a mistake to imagine that diplomats are simply passive participants in world events, or to suppose that any reasonably intelligent person would be qualified to do their jobs. Members of the American Foreign Service have deep experience in the regions where they serve, are conversant in foreign languages, and are well-qualified to interpret fast-moving and confusing events. And they are trained to do their jobs even when the stakes are high. The Secretary of State and the President rely on their judgment in situations where information is scarce and conditions are changing every hour. In the midst of such chaos and uncertainty, they must provide their best opinions and advice, clearly and concisely, about the murkiest of situations. And they must have the confidence and judgment to develop and enact new policies when that is what circumstances demand. In that way, Ford’s clear-eyed diplomacy is the essence of what the American people should expect of their public servants. As the situation in Syria has deteriorated, he has changed the tenor and substance of his diplomacy, keeping his sights firmly on U.S. interests the entire time. In July, he publicly travelled to Hama, a center of Syrian protest, delivering a powerful statement of how the United States views the Syrian authorities’ violent suppression of its people. More recently, fed up with the Syrian government’s refusal to let any American Embassy official travel outside the capital, Ford visited Jassem, another center of protest about 70 kilometers south of Damascus, without either notifying in advance or seeking the permission of the Syrian government. Will these visits make Assad’s government less authoritarian and more responsive to international calls to treat its people decently? Probably not, but no one should disregard their efficacy. His gestures spoke volumes. Such symbolic acts are far more eloquent and effective than any amount of bluster and evanescent “lines in the sand” that the next tide will wash away. Through his simple but bold acts, Ford clearly signaled that the United States will not remain silent while Bashar Assad’s government murders its own people. The message to the authorities in Damascus—and to all Syrians—is clear: “As American Ambassador to Syria, I am prepared to engage with that nation’s government. If it is not interested in discussion, however, I am also prepared, to act in pursuit of American national interests and show support for those seeking their universal rights.” It is a message that has not wavered for all the attacks that Ford and his embassy have faced in its wake from pro-Assad demonstrators. One could only wish that members of Congress would acquit themselves with as much diligence and professionalism as Ford has these past several months. Unfortunately, the ambassador’s own dealings with Washington suggest that is unlikely. Ford, a career Foreign Service Officer, Arabic speaker, and veteran of service in Iraq and Algeria, is present in Syria thanks only to a 2010 recess appointment from the president. A year earlier the Senate had failed to confirm him as ambassador, slighting both the importance of his posting, and his fitness for it. It’s unclear how the Senate will decide when it has another chance to confirm him in the current session. Ford is not the only example of extraordinary service offered by our diplomats. Another veteran Foreign Service officer, Ryan Crocker, came out of retirement in 2011, leaving an academic post at Texas A&M, to become ambassador to Afghanistan. Those who know Ryan Crocker expected no less of him. In the course of a 40-year career, Crocker had served in some of our toughest posts, including Iran, Iraq, Syria, Lebanon and Pakistan. The American people should know that they are being well-represented in Kabul by a professional, one who knows the region, speaks its languages, and will provide the president well-informed and frank advice. There are thousands of other diplomats serving quietly in difficult and dangerous conditions with little expectation of reward or recognition. They deliver humanitarian assistance, fight against infectious disease, combat terrorism, and provide assistance in anti-narcotics efforts. And they do not carry arms even in the most dangerous places. Their weapons are tact, respect, understanding, and judgment. But ultimately our diplomats’ most important support is their own credibility—credibility that they can only earn when their foreign counterparts know they are heard and respected in Washington. At home, unfortunately, our country’s federal government is dominated by another kind of representa­tion, whose defining traits seem to be bravado, dogma, and posturing. As for the listening and civility cultivated and practiced by our Foreign Service, those have long ago become lost arts in much of Washington. John Limbert served in Foreign Service for 34 years, mostly in the Middle East and Islamic Africa. He was also president of the American Foreign Service Association and is currently professor of Middle Eastern Studies at the U.S. Naval Academy.